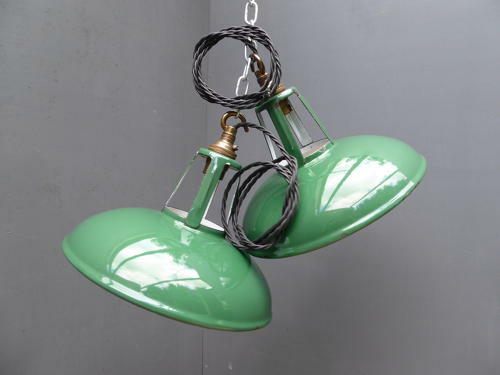 A good pair of original vintage industrial pendant lights in green & white enamel. A small pair of pendants of fantastic form with a wonderful, industrial yet almost delicate look about them! Rewired in twisted black flex with brass bulb holders & hanging hooks. Wear commensurate with age, good overall with a lovely gloss & a few chips as pictured. UK delivery available at £10, tracked & signed for 24 hour delivery. All electrical items should be checked and or installed by a qualified electrician prior to use.